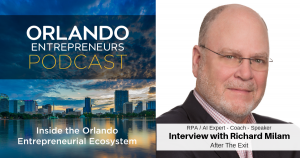 A pioneer in the Robotic Process Automation technology movement, Richard Milam brought a revolutionary operational efficiency solution to organizations worldwide with his conception of Foxtrot, the flagship product of the company he founded, EnableSoft, Inc.. Subsequent to the 2019 acquisition of EnableSoft by Nintex, Foxtrot RPA is now a key component of the world’s leading end to end Digital Process Automation solution. Prior to founding EnableSoft in 1995, he worked for the inventor of the ATM as an implementer of ATM networks around the world, held sales and consulting positions for several of the largest banking software companies, and served in the United States Navy as a nuclear-trained engineer in the Navy’s submarine service.